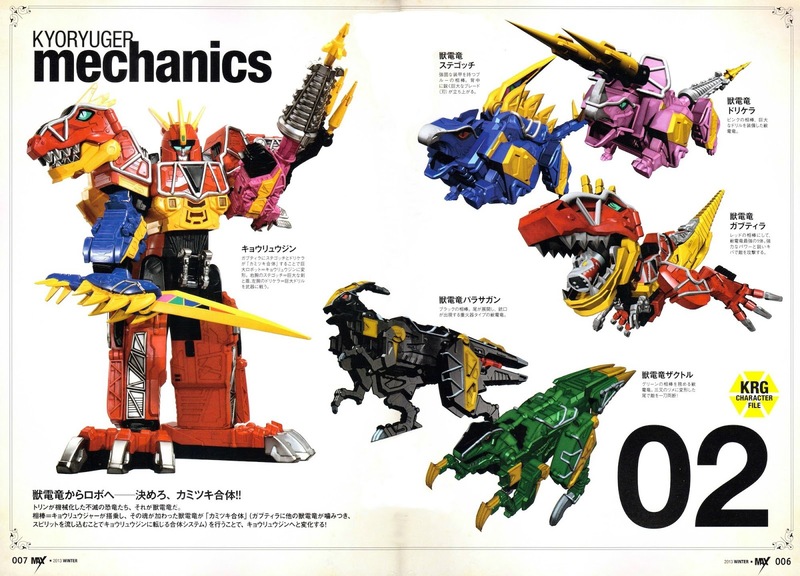 As the debut of Zyuden Sentai Kyoryuger arrives this Sunday JST, here are more images of the weapons, team and more as scanned from Toei Hero Max magazine. Other than that, is the summary of the first "Brave" of the series. Zyuden Sentai Kyoryuger BRAVE 1 is entitled: He's here! The Bright Red King. Check out the summary as seen on this month's issue of Hyper Hobby Magazine. In the ancient times, dinosaurs ruled the Earth. But due to extinction, they disappear from history. The modern humans now face a new crisis. The mysterious organization, the Devoss Army and its Zori Demon appeared and began attacking people. As the world faces dangers, Daigo Kiryu, a young man from the island on the southern seas, boldly confronts the enemies!